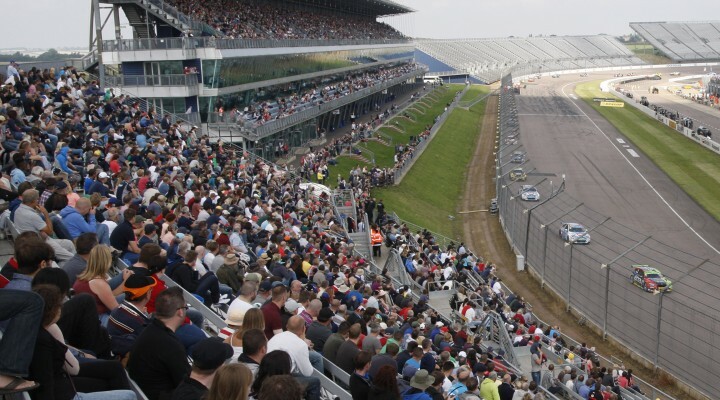 Dunlop MSA British Touring Car Championship leader Colin Turkington extended his advantage at the top of the standings with a double victory at Rockingham; before Rob Austin went on to score a hugely popular win in the final race. eBay Motors driver Turkington came into the weekend having never won at the Northamptonshire circuit but immediately banished that record in an exciting opener. The 2009 champion got the jump on pole-sitter Sam Tordoff off the line and despite coming under intense early pressure from the MG KX Clubcard Fuel Save racer, he eventually pulled clear to win by a comfortable margin. Pole-sitter Tordoff held on to second from team-mate Jason Plato until the finish. Most of the action was behind the lead trio, with fourth place changing hands several times before the Chrome Edition Restart Racing VW of Alain Menu took the position late on, completing an impressive drive by the Swiss star. Turkington doubled up with a dominant lights to flag victory in the second bout. MG duo Plato and Tordoff again filled the remaining podium positions but this time it was the double champion who led home his younger stable-mate. 25-year-old Tordoff was gobbled up by Plato initially and then lost out to the fast-starting Menu. He managed to squeeze his way back past the VW man on lap three, however, and went on to score his second podium of the day. Gordon Shedden put in a solid recovery drive after skipping across the grass early on, but he couldn’t match the pace being shown by the Exocet Racing Audi A4 of Austin and the soft-tyre shod Honda Civic of Andrew Jordan. The reigning champion scythed past both Menu and Mat Jackson’s Airwaves Racing Ford Focus to take fifth before Austin repeated the trick late on to round out the top six. When the dust settled it was Turkington who won comfortably from a fading Plato and Tordoff, with the latter having to act as the MG rear gunner as Jordan closed in at an alarming rate. Austin took fifth ahead of Menu with both then benefitting from the race three reverse grid draw, which saw them line-up on the front row for the final bout. Austin made a blistering start and immediately jumped by pole-sitter Menu before the 31 flame-spitting cars were even halfway towards the infamous turn two hairpin. From there Austin managed the gap back to the VW for the remainder of the contest, scoring his first win of the season while Menu took a first podium since his 2000 championship-winning campaign. A huge race-long battle ensued for the final place on the podium, which eventually went to Pirtek Racing’s Jordan after he fended off a gaggle of cars for the entire 16 laps. Honda Yuasa Racing’s Shedden endured a short and rather miserable final race after his Civic Tourer was damaged beyond repair in a first lap collision. The incident has also seriously dented Shedden’s title hopes as the 2012 champion now lies 64 points behind standings leader Turkington and nine back from second placed Plato. The next stop for the 2014 Dunlop MSA British Touring Car Championship will be at Silverstone on 27/28 September. Click here for the classification from Rockingham.